Sinai security sources confirm African migrants were shot but say circumstances of their deaths not yet determined. 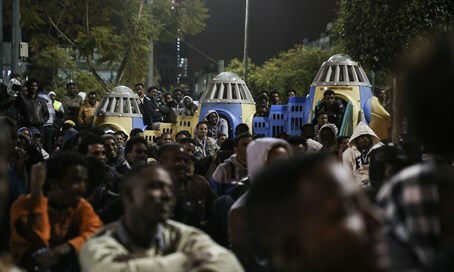 The bodies of 15 African migrants were found in Egypt's Sinai Peninsula near the Israeli border on Sunday after they were shot dead, security sources and a medical official said. "Fifteen bodies of Africans shot dead were found at dawn on Sunday south of (the town of) Rafah," said Tariq Khatir, a representative of the health ministry in North Sinai. "We also found eight Africans who were wounded but whose condition is stable." Security sources confirmed the migrants were shot but said the circumstances of their deaths had not yet been determined. Jihadists have stepped up their attacks against security forces in the north of the peninsula since the army's ouster of Islamist president Mohamed Morsi in 2013. The army also regularly announces the death or capture of jihadists although its figures cannot be independently verified.